Welcome to the third Dev Diary of Panzer Corps 2! This time we'll focus on aspects which were left out in the previous two diaries. As previously, though, we'll treat them in a rather generalistic way, but from the next dev diary onwards you can expect more indepth information about specific areas of the game. Despite a significant change in underlying technology (3D and Unreal Engine), we have tried to preserve the same general approach to graphics which always worked so well in past games. Terrain is clean and unobtrusive, and units are big, crystal-clear and stand out well from the map. This is important when the game has hundreds of different units, and the player must be able to distinguish them all at a glance. That’s why we never considered showing several smaller models for a single unit, which might look more “real”, but ultimately is not usable in this kind of a game. As for terrain, we have drawn a lot of inspiration from Panzer General 2, which was widely considered the most beautiful in the old Panzer General series. At the same time, our maps are not hand drawn or otherwise constructed from small atomic elements, and so they are much quicker to create. The UI in Panzer Corps 2 is a huge step forward in terms of functionality and usability when compared to its predecessor. It can scale to any monitor size (all assets are done in 4K and scale to the required size), adapt to any screen ratio, and allows scaling of certain elements (like the unit list and the minimap) to make the best use of screen space on any monitor, from square to super-wide or multiple monitor configuration. We are making sure that all information about unit stats, traits, game rules etc. is available directly on screen or in the tooltips and is easy to find. All commands will also be available on the screen and easily discoverable, without relying on hot keys and other obscure means to invoke a function. We can’t wait to show the new UI in action. Panzer Corps did not require the player to do a lot of routine micromanagement, but in the sequel we have tried to reduce it even further. For example, the player no longer needs to use “Supply” button manually. All units will receive their supply (fuel and ammo) automatically, as long as supply is possible. The AI in Panzer Corps 2 is a complete rewrite, it does not reuse any code from Panzer Corps, and it uses some more advanced approaches. This means that the sequel will feature a new, completely different AI opponent. The new AI is designed and implemented with random maps and random campaigns in mind. This means that it cannot rely on AI scripting at all. It must be able to figure out the structure of any map on its own, achieve any kind of scenario objective and try to prevent the opponent from doing the same. It can also purchase and deploy its whole army in case there are no preconfigured units in a given scenario. On the other hand, AI scripting options in Panzer Corps 2 are also richer than in its predecessor. This means that it is possible to fine-tune the AI to exact desired behavior, which can be useful in a historical setting. Modding community of Panzer Corps was always strong and vibrant, and we are fully committed to making Panzer Corps 2 a modder-friendly game as well. Panzer Corps 2 will include the editor from day one, and this editor will be even easier to use than the editor in Panzer Corps. Although the new map engine is 3D, scenario designer still only needs to specify terrain type for each hex, and the rest of the map will be generated by the engine automatically. Other useful features not found in its predecessor are full support of Undo/Redo, group operations on hexes and units and much more streamlined interface for scripting and AI. At the same time, the designer can bypass all UI and write scripts directly in Lua language which requires a certain skill but gives immense flexibility and power in return. Just like in Panzer Corps, gameplay data tables will remain in open text format and can be easily edited. People familiar with Unreal Engine can download Unreal Editor and create much deeper mods, which includes adding new units, new terrain types, changing map generation rules etc. Also, we are working on a proper mod manager which was sorely missing in Panzer Corps. The main point we were trying to make in these three introductionary dev diaries is that Panzer Corps 2 is far from a mere facelift. While staying true to traditions of the series, our goal is to improve playing experience across the board, and every single aspect of the new game receives a lot of thought and attention. It’s a huge and very ambitious project for our small team, and we really want to make it right, so it is taking a lot of time. In fact, much more time than originally expected. In hindsight, we were a bit too optimistic with our estimations and should have probably delayed the announcement. So, please bear with us, and we sure hope that once the game is released, it will be worth the wait. See you in the next dev diary! Beautiful units, shadows, terrain and UI. Everything looks clean and easily legible. Keep it up! Edit: one tiny criticism on the legibility- you're showing German (grey) and Soviet units (green), but looking top-down over all of the units make the two colours blend it too much. I think the PzC Soviet green was a bit more green-ish (less muted) than the one used here? Last edited by 13obo on Wed Aug 29, 2018 1:25 pm, edited 1 time in total. Yes, we agree with you. They will be tweaked in time. I like everything i read and I see about PC2 for now. But my first wish is a great management of infantry: I hope good graphique, good animation, wide choice and good balance. Hope next diary will be about infantry. We have thumbs up from kondi! I think it's safe to say PzC2 is on the right track. If you couple those nice graphics with campaigns as good as the original, it will be awesome. This aspect has me the most intrigued...I hope to see how this plays out and be amazed / frustrated at the dynamism this purports. Yes you're right. The sharpening Post Process was too high here. Its making the terrain look bad too. That was changed just as Alberto hit send. There's also a build camera/post processing issue thats currently knocking back the ambient light and messing up shadows and mip maps .. hense why the sides of vehicles are so dark and some vehicle textures aren't consistent. That's not proving so easy to solve. "We are making sure that all information about unit stats, traits, game rules etc. is available directly on screen or in the tooltips and is easy to find." even 'rate of fire' ? So much things that are music to my ears! 1) AI made to work with Random maps in mind: I find this very cool and this will be a huge step forwards in terms of replayability. 2) Graphics: I like this approach very much! Units may be a bit too big for me but I've only seen screenshot so I reserve further judgement for later. Overall they look really good and I can't wait to see the game in action. 3) Editor improvements: this, combined with the aforementioned new AI, will make possible drawing a map and creating a scenario in less time that the scenario will take to complete -- this is basically the reverse of 1% inspiration, 99% efforts -- this is extremely good news to me! It reminds me of map creation in simpler games like Advance Wars. I can't wait to play this game! - I would like to see the MP campaign in PZC2. - There is a Series field in the equipment file. I would like to have one more field, something like Series_Upgrade. Which would allow doing an upgrade of units only from the specified series_upgrade. This would allow subclassing in the unit class. Also, this mechanism would allow for cross-class upgrades. If one name of the Upgrade_Series is specified. I also wanted that there were directions for the upgrade. For example, use the symbols '+' and '-' before the name of the Series_Upgrade field can determine whether the unit can be upgraded to it or only from it. Everything about PzC2 looks and sounds great! Yet, as several people have said, it is hard to tell Soviet units apart from German ones. Unit paint color helps somewhat but probably less so with infantry or arty for example. How about adding a flag to each unit somehow? It would really help with a quick appraisal of the battlefield too. Thanks for support guys. BTW, this time around we've included hex grid in the screenshot. Do you prefer it this way? Not sure about the next one, but we'll definitely give some more information on this. Alas, infantry is not ready for prime time yet, and our temporary art was not exactly popular, so we are not showing any infantry just yet. 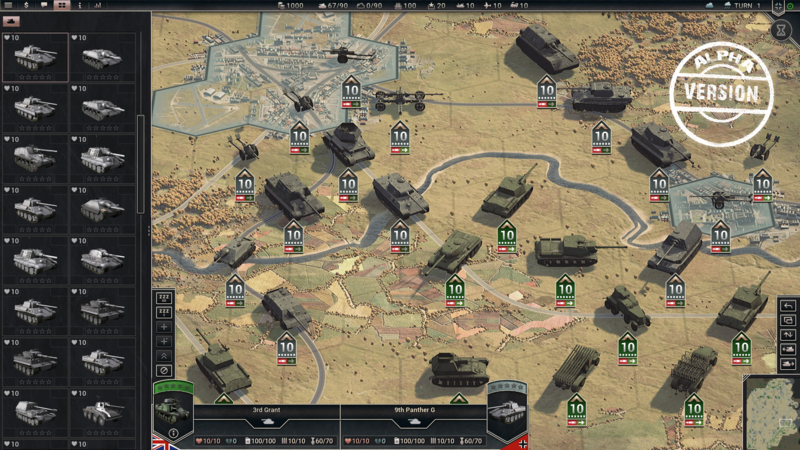 However, even the last screenshot has several towed, self-propelled and rocket artillery units. I hope that many people who designed campaigns for Panzer Corps will return in the new game as well. Haha, well, if you look at Panzer Corps equipment file, you will see that like 90% of units have it at default, and from remaining 10% most units have it at 9 or 11, which quite frankly does not give a huge difference. So, in Panzer Corps 2 this will not be a stat, but a trait assigned only to units which need it. All traits will be displayed directly in unit panel (to left and right from the class, where there is a lot of space). I'm glad that you like what you see so far, and sure hope that the finished game will not disappoint either. Units might be too big indeed, they were slightly smaller in previous dev diaries, but got bigger with some recent tweaks. In any event, you will have an option to adjust their size to your liking. It is true that scenario can be created quite fast, it was the case in Panzer Corps too. But it is rare to get a good scenario without testing. This is where most of the time goes when we work on our own content. We have been thinking about this for a long time, but player demand never looked big enough in the past. We'll see if the situation changed. In Panzer Corps 2 series mechanic is kinda obsolete, because all upgrades cost the difference between old and new unit. But what you describe should be easily doable with traits. Yet, as several people have said, it is hard to tell Soviet units apart from German ones. Unit paint color helps somewhat but probably less so with infantry or arty for example. I think, before we add flags or other elements, we need to try and extract maximum from what we have. Strength plates under units are quite big and prominent, but right now the difference in color between them is lacking. We'll increase it. Also, enemy units will not have move/attack actions and core chevron, which should additionally help to tell them from our own units. I don't understand how it says both 'it cannot rely on AI scripting' and 'AI scripting options are richer than predecessor'. Something was lost in translation, please clarify. AI scription options are of course available, because they play an important role in human-designed content. I could not remove such an important part of functionality. What I'm saying is, the new AI must also be competent enough on its own, without any scripting configured, because in random maps it won't have any. This creates higher requirements for AI implementation. Scripting and intelligence of the AI are two separate things in my view though they are intertwined. On one hand, you need the scripting to command the flow of the map you have designed, but that only dictates the general direction of the forces (or at least has been so far)- what should the AI defend, when to start a counter-attack, etc. Scripting hasn't been at the level of which unit to attack first, move first, to scout, softening up the enemy, when and how many hexes to retreat, what to resupply or units to buy, etc. These tasks were left to the AI intelligence and is independent of the scripting whether it exists or not. The order that the AI moves and attack with its units was pre-set in PzC and could be exploited. One could bait the AI, into attacking weak ground/air units that are actually well defended, but there were other things to exploit like knowing that AI moves artillery at start and end of the turn (if I remember correctly, been awhile since I played). I'm hoping both scripting and AI intelligence have been upgraded, and whether a map is scripted or not, the AI intelligence should be able to make wiser decisions than before to make it a worthy challenger. EDIT: Since it's a bit too boring perhaps for the regular reader in a future Dev Diary, perhaps Rudankort could give us some details as to how scripting and AI was improved in comparison to PzC? Anything on the commands you can give the AI or the execution of those commands would be interesting! Last edited by 13obo on Wed Aug 29, 2018 9:36 pm, edited 2 times in total.